Kool-Aid! Get your Kool-Aid here! Avid has unveiled the latest update to their editing suite family: Media Composer & Symphony 5.5, as well as DS 5.5. Below are some of the biggest features to the Media Composer and Symphony 5.5 releases. Video I/O: AJA I/O Express. The AJA IO Express, unlike the Matrox MXO 2 Mini, is unrestricted by Avid to capture into Media Composer via HDSDI & HDMI, and output via HDSDI, Component, and HDMI. It sports an RS-422 com port for deck control – and yes, digital cuts are supported. Like the Matrox unit and the Avid branded I/O devices, it connects to your CPU via an included host (HBA) Card. As of the initial 5.5 release, Ancillary Data and LTC are not supported…yet. I’m an AJA fanboy, and I think partnering with the best in the industry is a fantastic move. One of the newer codecs – AVC-Intra – delivers excellent visual quality at lower data rates, and has been popping up more and more in prosumer and professional cameras. Beauty and brains does have a downside, however: it’s extraordinarily CPU intensive. Avid now has a solution for you. For $2495, you can purchase an AVC-Intra accelerator card for your Media Composer Nitris DX. This small hardware card gets installed inside your Nitris DX Box, and allows for AVC-Intra encoding during capture – as well as assisting during decoding: edit, monitoring, and processing. Sorry Mojo DX users, this cannot be used with your I/O; as the the Mojo DX offers no hardware expandability. Eye ballin’ a new Symphony Nitris DX? Another reason to buy: The AVC-Intra card comes included with a new purchase of a Symphony Nitris DX. Check out the Media Composer Nitris DX AVC-Intra here. Don’t you constantly rely on the Search function of your OS? (I use my Apple + F search religiously.) Most of us would be unable to function without it. Avid has taken two steps to improve the effective of it’s search tools. First, the standard text search tool has been expanded to search across more metadata within your project: clips, sequences, script text, the timeline, and your monitors. As if that were not enough, Media Composer now has an ability to search via phonetic matching, a new feature called PhraseFind. Media Composer automatically analyzes clips and indexes all dialog in your project’s media phonetically, so you can quickly find clips by simply typing a word or phrase—right from within your edit session. Plus, it works in the background so as not to tie up your editing bay. Bonus! Coupled with ScriptSync, this becomes a massively powerful tool to reduce the time lost to logging and assemblies and finding that illusive lost clip. PhraseFind, as well as ScriptSync, come at an additional cost ($495 & $995, respectively) or bundle both for only $1295. Hear That? Enhanced Audio Monitoring. 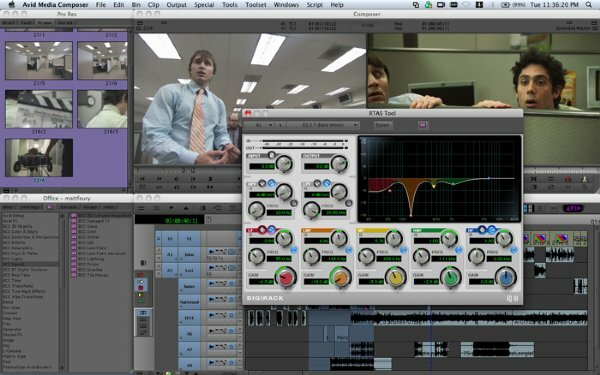 Avid has incorporated the ability to utilize Pro Tools hardware for monitoring of your Media Composer. Pro Tools HD hardware, as well as select flavors of the MBox family can be used for audio playback. (MBox3 for sure, I’m unsure if MBox 2 is supported. The original MBox is not) AIR plug-ins will also be supported within Media Composer 5.5. AMA is probably the single greatest thing Avid has rolled out in recent history, and with 5.5, Media Composer continues down that path. The HDCAM SR Lite codec is now supported. First incarnations of support do not include writeback to HDCAM SR, however. Transcoding / mixdown is necessary. Those of you who insist on using Long GOP video files (you know who you bastards are) will be thrilled to learn that Avid has beefed up Media Composer’s ability to play these in real time. While it is impossible to qualify every hardware and software configuration when dealing with AMA, v5.5 will handle your Long GOP files better than 5.0. Plus, Media Composer has also enabled Long GOP Quicktime reference exports (this last feature was quietly available not to long ago in 5.0.3 versions) In case you didn’t know, Media Composer uses your GPU – Graphics card – to during playback to take load off of your CPU. So, always consider beefing up your Graphics card to speed up your system…staying within the approved list of cards, of course. You’ll also see a change in how AMA is installed on machines. AMA, as you may know, is a plug-in architecture. XDCAM, P2, Quicktime, GFCAM, etc., are all separate AMA plug-ins. As is the case with most plug-ins, development can continue on these separate of changes to the host application itself. Because of this, AMA plug-ins are now going to be hosted on Avid’s website for download. (Yes, they are free.) This ensures that the user can always get the most up to date plug-in ‘builds’. Media Composer 5.5 will come bundled with the Quicktime AMA plug-in only. Media Composer 5.5 will be the last version that supports the Adrenaline hardware. It will also be the last 32bit build of Media Composer. Unity MediaNet 4.x is no longer supported. Have you looked into the next generation of Avid Shared storage – the ISIS 5000 and ISIS 7000? Ethernet is the new Fibre, yo. 4GB of RAM is required for operation. The Matrox MXO2 Mini is now able to output true Progressive (P) frame rates, and the h.264 MAX option is now supported to accelerate Matrox h.264 exports out of Media Composer. This means faster exports for web and mobile devices directly out of Media Composer. The Avid (Euphonix) Artist Series (Artist Control, Artist Mix, and Artist Transport) controllers are supported within Media Composer 5.5. Enchanced Smart tool: Adjust a transition’s timing within the Timeline without stepping into the effects palette. There is *no* change in the Avid Stereoscopic workflow. Metafuze is still used to mux left and right eyes into a single HD frame size. Only single link output from an I/O device is available, in the same flavor it was Metafuze’d in. Mea Culpa: A misconception (and one that I’ve been guilty of) about Avid hardware needs to be rectified. The Mojo DX offers no hardware acceleration, during capture or playback. The Nitris DX offers DNxHD hardware acceleration during capture and playback. Marketing literature has been vague on this point. # Enchanced Smart tool: Adjust a transition’s timing within the Timeline without stepping into the effects palette. We never needed to step into the effects palette to do that; instead, just press the button for Quick Dissolve and tweak away on a big mini-GUI… all QD ever needed was a “Play” and “Play Loop” button, but that would have been too easy.sheesh. The Mini GUI is still invoked into a separate window of outside of the timeline, i.e. another window,…and I’ve always called it the effects palette – my apologies if my nomenclature is off. Can I still use the term “Hamburger Menu”? Thanks for reading, but I respectfully disagree. AVC-Intra runs at 100Mb/s or 50Mb/s. This is WAY less than base level broadcast quality compressed HD (ProRes 422 or DNx145). It’s also way less than uncompressed (SD or HD) files, or DPX. Avid is used in Post Production, and as a Post Production codec, it is certainly a lower bit rate. The term “Prosumer” is also left to interpretation. Is it ARRI RAW? Is it Uncompressed? Is it Cineform? Is it RED Raw? No, it’s not that high end. Is it HDV? No. Is it a Flip Cam h.264? No. Thus, I summit It lands smack in the middle – Prosumer. “”The Matrox MXO2 Mini is now able to output true Progressive (P) frame rates…” – What does this actually mean? I have a MXO2 mini right now with Avid 5.0.3 and output via HDMI to an entry-level Sony reference monitor. Am I not seeing 720p output unless I upgrade to version 5.5? My apologies for the delay, I’ve been at NAB! Avid introduced additional frame rate support with 5.5.x. 5.0.x was lacking in some frame rate ability. Media Composer 5.5.1 now support Matrox MXO2 Mini and Mini MAX resolutions and frame rates including 720p 23.98, 1080p 23.98, 1080p 24, 1080p 25, 1080p 29.97, and 1080p 30. There is now also the ability to select PsF or true P output in 1080p modes. The whole FAQ is here: Matrox MX02 Mini FAQ. It’s possible that your project rate is not compatible with your monitor – either by virtue of the Matrox MXO 2 Mini, or the monitor. I would track down the specs of the monitor, and compare them to your project and see if the monitor is capable of that frame rate/size. If they are, then check the Matrox to ensure the unit can pass that signal natively without having Media Composer do a cross convert on the way out. I use the 720p/30PN setting on my Panasonic camera and setup my Avid project as 720p/29.97. I guess I have never really looked into my Matrox utility to see what it’s set at. I would assume I would set the Matrox box to my Sony HD monitor. No problem on response time Michael! I figured you were at the NAB. I hope you enjoyed it! I heard you on Larry Jordan’s Internet broadcast. Nice work.